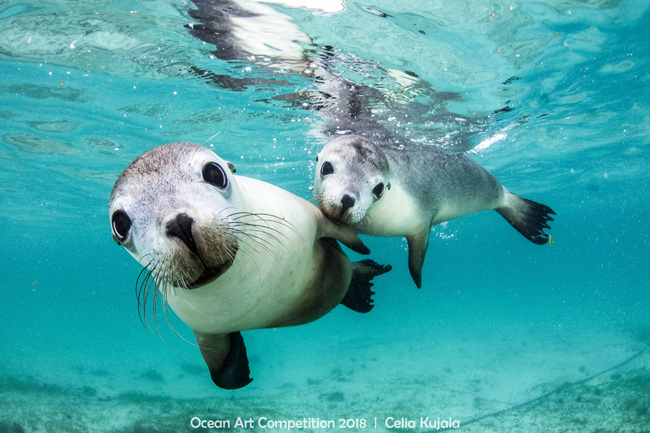 The Story: The Australian sea lion is one of the most endangered pinnipeds in the world. One place they can be found is Essex Rocks in the Jurien Bay Marine Park. I was in shallow water, when two Australian sea lion pups swooshed in my direction. They were playing and zipping around each other in what appeared to be a beautiful underwater ballet. However, what happened next was even more special. As they neared me, I must have piqued their interest because the two playful friends became two inquisitive friends and swam to check me out. I was able to capture them at the exact moment they were perfectly posed and staring at me with their curious eyes. I love observing wildlife underwater, but the moments when one connects with wildlife are even more extraordinary. I hope to share with people the magic that I felt.